The Burleson Files | Perspective. This year marks the 100th anniversary of the birth of Ted Williams, one of the greatest hitters to ever play professional baseball. 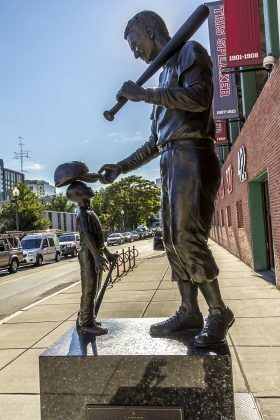 PBS and Major League Baseball recently aired a special documentary about Williams and his last four plate appearances at Fenway Park. For the last six decades, every single frame of film documenting Williams and his last at bat ever, where he hit his final of 521 home runs and refused to acknowledge in any way the standing ovation by thousands of screaming Red Sox fans, has been watched in black and white. That’s why Nick Davis, the director of the new documentary, almost fell out of his chair when a stranger named Bill Murphy called him and said he had vivid color film footage from the 1960 ballgame, where he roamed around the stadium and captured all four of Williams’ last at bats with his 8-millimeter color film camera. Murphy was a 19-year-old art student at the time. He wasn’t a big fan of baseball but felt the last game of one of the greatest players ever was significant and that he should be there. Even the professionals documenting that game didn’t have the foresight to do it in color and every single one of them had Williams from the same angle for each plate appearance. The fact that this young art student had the foresight to roam around the stadium, recording Williams from different angles, changes the experience entirely. The director said it changes everything. “The color, the intimacy and the visual experience is the holy grail,” Davis said. I see this all the time in business. While the experienced professionals are busy recording in black and white from the same angle, some young, inexperienced third-party observer comes up and shows us an entirely new experience, a new way of looking at things, all by changing the perspective, by adjusting the angle. You’ve seen it too. It’s hard to see the log in our own eyes when we’re busy pointing out the splinters in the eyes of everyone else around us. It’s why I insist on learning more from those outside our profession. Business leaders at the Disney Institute or Ritz Carlton can instantly see what needs fixed inside my practices and throughout my marketing that 99% of orthodontists would never notice. When’s the last time you had a new third-party observer come into your practice and show you a different angle? Unlike Major League Baseball, I hope it doesn’t take you 58 years to find the holy grail. Change your perspective. Force yourself to see things through a different angle.